At its WWDC 2017 developer conference, Apple has launched a new iPad Pro model with a 10.5″ Retina display to replace the previous 9.7″ version. While the display is approximately 20% larger the 10.5″ version retains the old iPad Pro’s dimensions and one pound weight. This has been achieved by reducing the display bezels by nearly 40%. The larger screen size also allows for displaying a full-size on-screen keyboard and connecting a full-size Apple Smart Keyboard. But the display isn’t just larger – at 600 nits it is also 50% brighter than before, and for the first time allows for viewing of HDR video on an iPad. In addition, the display features Apple’s true tone wide color gamut and ultra-low reflectivity. It also comes with a new technology that Apple calls ProMotion. 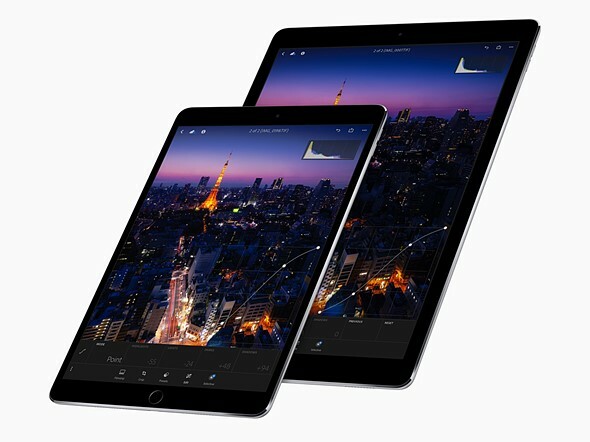 ProMotion uses the new iPad Pro’s improved hardware resources to increase the display refresh rate from 60Hz to 120Hz. 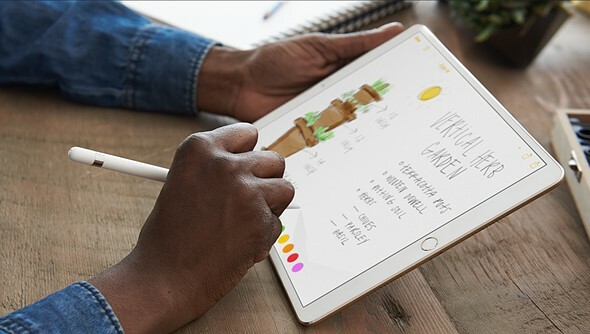 This means smoother and more responsive motion on the display and more fluid drawing when using the Apple Pencil stylus. In addition, ProMotion can dynamically adjust the refresh rate for different types of content. Quick moving content gets the full 120Hz treatment while still images can be displayed at lower frequencies in order to increase battery life. In the processor department the new iPad Pro models come with Apple’s new A10x Fusion CPU which is 30% faster than the A9 chip and delivers 40% faster graphics performance. That’s approximately 500 times the graphics performance of the original iPad. Despite the increase in performance, the new iPad Pro retains the old model’s 10 hour battery life. The built-in camera has been upgraded to the same camera module you can find in the iPhone 7. This means the iPad Pro now comes with a 12MP sensor, optical image stabilization a fast 1.8 aperture and the ability to record 4K video. At the front there’s a 7MP FaceTime camera. Storage has been doubled and the new iPad Pro models now start at 64GB of built-in memory. The new 10.5″ inch models starts at $649.